Bihar Gram Swaraj Yojna Society is ready to hire the applicants for the 698 available seats of Block Facilitator, Accountant, Assistant Jobs as per the BGSYS Recruitment 2017 advertisement published on department web portal. Job seekers who have required eligibility may apply through Online Mode after reading all the details of BGSYS Recruitment 2017 through this section.Candidates who meet the eligibility criteria and interested to apply they can submit their application form before the last date that is 15th November 2017. Education Needed : Candidates who are willing to apply for BGSYS jobs must posses PG Diploma / Graduation Degree / Post Graduation Degree / Engineering Degree from any recognized board or institution. The candidates who wish to apply for the available vacancy should be existing between 32 to 65 Years (Post 1), 30 to 55 Years (Post 2-6), 28 to 55 Years (Post 7-9,15), 25 to 55 Years (Post 10,16-22), 23 to 55 Years (Post 11-14), 22 to 55 Years (Post 23-25) As on 01-10-2017. Reserved category applicants will get the age relaxation as per BGSYS norms. Emoluments given to Employee: Contenders who will be appointed successfully for BGSYS Vacancy, they get the salary pay band of Rs. 74,709 - 89,070/- (Post 1), Rs. 62,933 - 89,070/- (Post 2-6), Rs. 43,769 - 61,433/- (Post 7-9), Rs. 21,733 - 32,360/- (Post 10,11), Rs. 19,579 - 28,770/- (Post 12,13), Rs. 15,000/- (Post 14), Rs. 42,476 - 71,068/- (Post 15), Rs. 30,955 - 43,381/- (Post 16-20), Rs. 16,870 - 24,218/- (Post 21,24,25), Rs. 14,465 - 18,874/- (Post 22), Rs. 29,752 - 41,644/- (Post 23) as per organization norms. Dead Line To Submit Online Application Is : 15-11-2017. Click Here For BGSYS Official Notification Link. Meghalaya Urban Development Agency is ready to hire the applicants for the 03 available seats of State Mission Manager, City Mission Manager Jobs as per the MUDA Recruitment 2017 advertisement published on department web portal. Job seekers who have required eligibility may apply through Offline Mode after reading all the details of MUDA Recruitment 2017 through this section.You are needed to send the application form in the appropriate format at the below address till or before 1st November 2017. Education Needed : Candidates who are willing to apply for MUDA jobs must posses Graduation Degree / Post Graduation Degree / PG Diploma from any recognized board or institution. Emoluments given to Employee: Contenders who will be appointed successfully for MUDA Vacancy, they get the salary pay band of Rs. 20,000/- as per organisation norms. Last Date for Receiving Hard Copy of Application Form Is : 01-11-2017. Click Here For MUDA Official Notification Link. North-Eastern Hill University is ready to hire the applicants for the 16 available seats of Librarian, Controller of Examinations, Finance Officer Jobs as per the NEHU Recruitment 2017 advertisement published on department web portal. Job seekers who have required eligibility may apply through Offline Mode after reading all the details of NEHU Recruitment 2017 through this section.You are needed to send the application form in the appropriate format at the below address till or before 30th November 2017. Education Needed : Candidates who are willing to apply for NEHU jobs must posses Engineering Degree / Post Graduation Degree from any recognized board or institution. Job hunters belonging to Women / PWD Category are exempted from such payment of processing fee. Emoluments given to Employee: Contenders who will be appointed successfully for NEHU Vacancy, they get the salary pay band of Rs. 37,400 - 67,000/- Plus Grade Pay Of Rs. 10,000/8900/-. (1-6), Rs. 15,600 - 39,100/ Plus Grade Pay Of Rs. 7600/6000/5400/-. (7-12) as per organisation norms. Closing Date to Submit Hard Copy of Application Form Is : 30-11-2017. Click Here For NEHU Official Notification Link. National Institute of Immunology is ready to hire the applicants for the 03 available seats of Junior Research Fellow/Senior Research Fellow Jobs as per the NII Recruitment 2017 advertisement published on department web portal. Job seekers who have required eligibility may apply through Offline Mode after reading all the details of NII Recruitment 2017 through this section.You are needed to send the application form in the appropriate format at the below address till or before 16th November 2017. Education Needed : Candidates who are willing to apply for NII jobs must posses Master Degree from any recognized board or institution. Emoluments given to Employee: Contenders who will be appointed successfully for NII Vacancy, they get the salary pay band of Rs. 25,000/- (Post 1), Rs. 28,000/- (Post 2) as per organisation norms. Deadline to Submit the Application Is : 16-11-2017. Click Here For NII Official Notification Link. Department for Women Development & Child Welfare is ready to hire the applicants for the 70 available seats of Anganwadi Teacher, Anganwadi Helper Jobs as per the DWDCW Recruitment 2017 advertisement published on department web portal. Job seekers who have required eligibility may apply through Online Mode after reading all the details of DWDCW Recruitment 2017 through this section.Candidates who meet the eligibility criteria and interested to apply they can submit their application form before the last date that is 3rd November 2017. Education Needed : Candidates who are willing to apply for DWDCW jobs must posses 10th / 12th / Graduation from any recognized board or institution. The candidates who wish to apply for the available vacancy should be existing between 21 to 35 years as on 01-07-2017. Reserved category applicants will get the age relaxation as per DWDCW norms. Online Registration of Application Form Ends On : 03-11-2017. Click Here For DWDCW Official Notification Link. National Atmospheric Research Laboratory is ready to hire the applicants for the 04 available seats of Technical Assistant, Technician Jobs as per the NARL Recruitment 2017 advertisement published on department web portal. Job seekers who have required eligibility may apply through Online Mode after reading all the details of NARL Recruitment 2017 through this section.Candidates who meet the eligibility criteria and interested to apply they can submit their application form before the last date that is 27th November 2017. Education Needed : Candidates who are willing to apply for NARL jobs must posses 10th / 12th / ITI / NTC / NAC / Diploma from any recognized board or institution. Reserved category applicants will get the age relaxation as per NARL norms. Emoluments given to Employee: Contenders who will be appointed successfully for NARL Vacancy, they get the salary pay band of Rs. 44,900 - 1,42,400/- (Post 1,2), Rs. 21,700 - 69,100/- (Post 3,4) as per organization norms. Opening Date of Online Registration of Application Form Is : 28-10-2017. Online Registration of Application Form Ends On : 27-11-2017. Click Here For NARL Official Notification Link. National Project Implementation Unit is ready to hire the applicants for the 1270 available seats of Assistant Professor Jobs as per the NPIU Recruitment 2017 advertisement published on department web portal. Job seekers who have required eligibility may apply through Online Mode after reading all the details of NPIU Recruitment 2017 through this section.Candidates who meet the eligibility criteria and interested to apply they can submit their application form before the last date that is 19th November 2017. Education Needed : Candidates who are willing to apply for NPIU jobs must posses Engineering Degree / Post Graduation Degree from any recognized board or institution. The candidates who wish to apply for the available vacancy should not be more than 40 Years As on 19-11-2017. Reserved category applicants will get the age relaxation as per NPIU norms. Emoluments given to Employee: Contenders who will be appointed successfully for NPIU Vacancy, they get the salary pay band of Rs. 70,000/- as per organization norms. Online Registration Ends On : 19-11-2017. Click Here For NPIU Official Notification Link 1. Click Here For NPIU Official Notification Link 2. District Court Thanjavur is ready to hire the applicants for the 04 available seats of Junior Administrative Assistant Jobs as per the District Court Thanjavur Recruitment 2017 advertisement published on department web portal. Job seekers who have required eligibility may apply through Offline Mode after reading all the details of District Court Thanjavur Recruitment 2017 through this section.You are needed to send the application form in the appropriate format at the below address till or before 26th November 2017. Education Needed : Candidates who are willing to apply for District Court Thanjavur jobs must posses 12th / Diploma from any recognized board or institution. The candidates who wish to apply for the available vacancy should be existing between 18 to 30 Years As on 01-07-2017. Reserved category applicants will get the age relaxation as per District Court Thanjavur norms. Last Date to Submit Hard Copy of Application Form Is : 26-11-2017. Click Here For District Court Thanjavur Official Notification Link. National Bureau of Agricultural Insect Resources is ready to hire the applicants for the 01 available seats of Labour Jobs as per the NBAIR Recruitment 2017 advertisement published on department web portal. Job seekers who have required eligibility may apply after reading all the details of NBAIR Recruitment 2017 through this section.Candidates who have decided to build their career in this organization they can attend Walkin Interview which are going to be held On 31st October 2017. Education Needed : Candidates who are willing to apply for NBAIR jobs must posses 12th from any recognized board or institution. Reserved category applicants will get the age relaxation as per NBAIR norms. Emoluments given to Employee: Contenders who will be appointed successfully for NBAIR Vacancy, they get the salary pay band of Rs. 10,000/- as per organization norms. Click Here For NBAIR Official Notification Link. North Western Railway is ready to hire the applicants for the 1164 available seats of Apprentices Jobs as per the NWR Recruitment 2017 advertisement published on department web portal. Job seekers who have required eligibility may apply through Online Mode after reading all the details of NWR Recruitment 2017 through this section.Candidates who meet the eligibility criteria and interested to apply they can submit their application form before the last date that is 29th November 2017. Education Needed : Candidates who are willing to apply for NWR jobs must posses 10th / ITI from any recognized board or institution. The candidates who wish to apply for the available vacancy should be existing between 15 to 24 Years As on 30-10-2017. Reserved category applicants will get the age relaxation as per NWR norms. Starting Date For Online Application Is : 30-10-2017. Dead Line For Apply Online : 29-11-2017. Click Here For NWR Official Notification Link. Cantonment Board Amritsar is ready to hire the applicants for the 67 available seats of Clerks, Safaiwala Jobs as per the Cantonment Board Amritsar Recruitment 2017 advertisement published on department web portal. Job seekers who have required eligibility may apply through Online Mode after reading all the details of Cantonment Board Amritsar Recruitment 2017 through this section.Candidates who meet the eligibility criteria and interested to apply they can submit their application form before the last date that is 26th November 2017. Education Needed : Candidates who are willing to apply for Cantonment Board Amritsar jobs must posses 8th / Graduation Degree from any recognized board or institution. The candidates who wish to apply for the available vacancy should be existing between 18 to 25 Years As on 26-11-2017. Reserved category applicants will get the age relaxation as per Cantonment Board Amritsar norms. Emoluments given to Employee: Contenders who will be appointed successfully for Cantonment Board Amritsar Vacancy, they get the salary pay band of Rs. 10,300 - 34,800/- plus Grade Pay of Rs. 3200/-. (Post 1), Rs. 4900 - 10,680/- plus Grade Pay of Rs. 1650/-. (Post 2) as per organization norms. Dead Line To Submit Online Application Is : 26-11-2017. Click Here For Cantonment Board Amritsar Official Notification Link. 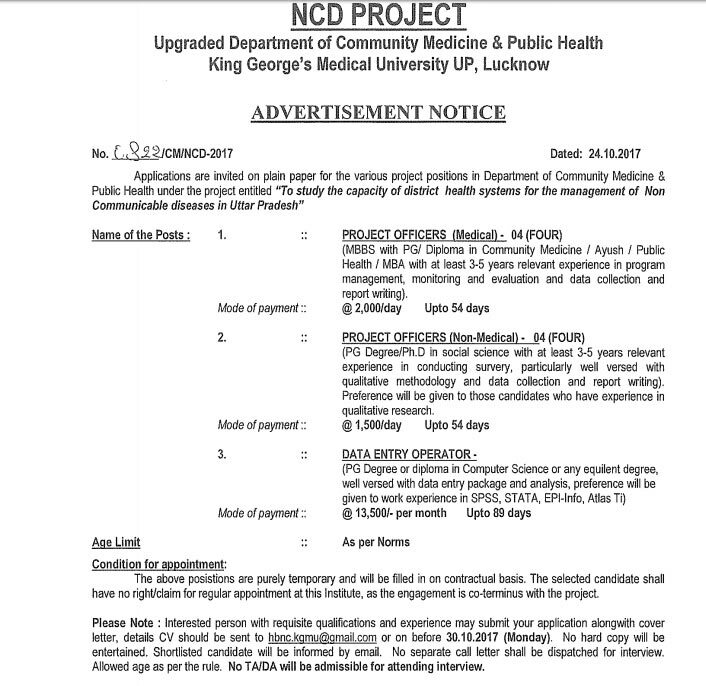 King George’s Medical University is ready to hire the applicants for the 08 available seats of Project Officer, Data Entry Operator Jobs as per the KGMU Recruitment 2017 advertisement published on department web portal. Job seekers who have required eligibility may apply after reading all the details of KGMU Recruitment 2017 through this section.Candidates who meet the eligibility criteria and interested to apply they can send their soft copy of application form through Email before the last date that is 30th October 2017. Education Needed : Candidates who are willing to apply for KGMU jobs must posses Diploma / Post Graduation Degree from any recognized board or institution. Emoluments given to Employee: Contenders who will be appointed successfully for KGMU Vacancy, they get the salary pay band of Rs. 2000/- Per Day (Post 1), Rs. 1500/- Per Day (Post 2), Rs. 13,500/- Per Month (Post 3) as per organisation norms. Closing Date to Send Copy of Application Form Is : 30-10-2017. Click Here For KGMU Official Notification Link. Office of the District Judge Jagatsinghpur is ready to hire the applicants for the 11 available seats of Clerk, Salaried Admin Jobs as per the Office of the District Judge Jagatsinghpur Recruitment 2017 advertisement published on department web portal. Job seekers who have required eligibility may apply through Offline Mode after reading all the details of Office of the District Judge Jagatsinghpur Recruitment 2017 through this section.You are needed to send the application form in the appropriate format at the below address till or before 14th November 2017. Education Needed : Candidates who are willing to apply for Office of the District Judge Jagatsinghpur jobs must posses 10th / 12th from any recognized board or institution. The candidates who wish to apply for the available vacancy should be existing between 18 to 32 years as on 14-11-2017. Reserved category applicants will get the age relaxation as per Office of the District Judge Jagatsinghpur norms. Emoluments given to Employee: Contenders who will be appointed successfully for Office of the District Judge Jagatsinghpur Vacancy, they get the salary pay band of Rs. 19,900/- (Post 1, 2), Rs. 21,700/- (Post 3) as per organization norms. Selection of the job hunters will be done on the basis of their performance in the Computer Science Test, Viva-Voce Test conducted by the selection committee. Last Date to Submit Hard Copy of Application Form Is : 14-11-2017. Click Here For Office of the District Judge Jagatsinghpur Official Notification Link. India Agricultural Statistics Research Institute is ready to hire the applicants for the 16 available seats of IT Professional Jobs as per the IASRI Recruitment 2017 advertisement published on department web portal. Job seekers who have required eligibility may apply after reading all the details of IASRI Recruitment 2017 through this section.Candidates who have decided to build their career in this organization they can attend Walkin Interview which are going to be held On 10th November 2017. Education Needed : Candidates who are willing to apply for IASRI jobs must posses 12th / Diploma / Graduation Degree / Master Degree from any recognized board or institution. Those aspirants who are belonging to General/ OBC Category & interested to apply for above posts they need to be paid Processing fee of _/-. The candidates who wish to apply for the available vacancy should not be more than 35 Years (Post 1,2), 40 Years (Post 3,4). Reserved category applicants will get the age relaxation as per IASRI norms. Emoluments given to Employee: Contenders who will be appointed successfully for IASRI Vacancy, they get the salary pay band of Rs. 25,000/- (Post 1), Rs. 40,000/- (Post 2), Rs. 50,000/- (Post 3), Rs. 60,000/- (Post 4) as per organization norms. Walk In Date : 10-11-2017. Click Here For IASRI Official Notification Link. Indian Museum is ready to hire the applicants for the 05 available seats of Consultant, UDC Jobs as per the Indian Museum Recruitment 2017 advertisement published on department web portal. Job seekers who have required eligibility may apply through Offline Mode after reading all the details of Indian Museum Recruitment 2017 through this section.You are needed to send the application form in the appropriate format at the below address till or before 13th November 2017. Education Needed : Candidates who are willing to apply for Indian Museum jobs must posses Graduation Degree / Post Graduation Degree from any recognized board or institution. The candidates who wish to apply for the available vacancy should not be more than 62 Years. Reserved category applicants will get the age relaxation as per Indian Museum norms. Emoluments given to Employee: Contenders who will be appointed successfully for Indian Museum Vacancy, they get the salary pay band of Rs. 30,000/- (Post 1,2), Rs. 25,000/- (Post 3), Rs. 15,000/- (Post 4) as per organization norms. Deadline to Submit Hard Copy of Application Form Is : 13-11-2017. Click Here For Indian Museum Official Notification Link. Election Commission of India is ready to hire the applicants for the Various available seats of Media Support Executive Jobs as per the ECI Recruitment 2017 advertisement published on department web portal. Job seekers who have required eligibility may apply through Offline Mode after reading all the details of ECI Recruitment 2017 through this section.You are needed to send the application form in the appropriate format at the below address till or before 22nd November 2017. Education Needed : Candidates who are willing to apply for ECI jobs must posses PG Diploma / Post Graduation Degree from any recognized board or institution. Emoluments given to Employee: Contenders who will be appointed successfully for ECI Vacancy, they get the salary pay band of Rs. 50,000/- as per organization norms. Click Here For ECI Official Notification Link. Educational Consultants of India Limited is ready to hire the applicants for the 12 available seats of Consultant, Nodal Officer Jobs as per the EDCIL Recruitment 2017 advertisement published on department web portal. Job seekers who have required eligibility may apply through Online Mode after reading all the details of EDCIL Recruitment 2017 through this section.Candidates who meet the eligibility criteria and interested to apply they can submit their application form before the last date that is 30th November 2017. Education Needed : Candidates who are willing to apply for EDCIL jobs must posses PG Diploma / Engineering Degree / Post Graduation Degree from any recognized board or institution. Reserved category applicants will get the age relaxation as per EDCIL norms. Emoluments given to Employee: Contenders who will be appointed successfully for EDCIL Vacancy, they get the salary pay band of Rs. 75,200 - 1,40,900/- (Post 1), Rs. 64,400 - 1,30,500/- (Post 2,3) as per organization norms. Click Here For EDCIL Official Notification Link. Ordnance Factory Dum Dum is ready to hire the applicants for the 01 available seats of Medical Practitioner Jobs as per the Ordnance Factory Dum Dum Recruitment 2017 advertisement published on department web portal. Job seekers who have required eligibility may apply after reading all the details of Ordnance Factory Dum Dum Recruitment 2017 through this section.Candidates who have decided to build their career in this organization they can attend Walkin Interview which are going to be held On 13th November 2017. Education Needed : Candidates who are willing to apply for Ordnance Factory Dum Dum jobs must posses MBBS Degree from any recognized board or institution. Reserved category applicants will get the age relaxation as per Ordnance Factory Dum Dum norms. Emoluments given to Employee: Contenders who will be appointed successfully for Ordnance Factory Dum Dum Vacancy, they get the salary pay band of Rs. 75,000/- as per organization norms. Click Here For Ordnance Factory Dum Dum Official Notification Link. National Centre for Disease Control is ready to hire the applicants for the 12 available seats of Consultant, Training Manager, Accounts Officer Jobs as per the NCDC Recruitment 2017 advertisement published on department web portal. Job seekers who have required eligibility may apply after reading all the details of NCDC Recruitment 2017 through this section.Candidates who have decided to build their career in this organization they can attend Walkin Interview which are going to be held On 15th November 2017. Education Needed : Candidates who are willing to apply for NCDC jobs must posses Graduation Degree / Post Graduation Degree from any recognized board or institution. The candidates who wish to apply for the available vacancy should not be more than 62 Years (Post 1), 60 Years (Post 2,4,6), 65 Years (Post 3), 40 Years (Post 5,7). Reserved category applicants will get the age relaxation as per NCDC norms. Emoluments given to Employee: Contenders who will be appointed successfully for NCDC Vacancy, they get the salary pay band of Rs. 60,000/- (Post 1), Rs. 56,448/- (Post 2), Rs. 49,500/- (Post 3,4), Rs. 35,000/- (Post 5), Rs. 30,000/- (Post 6), Rs. 19,000/- (Post 7) as per organization norms. Click Here For NCDC Official Notification Link. Jharkhand Rural Health Mission Society is ready to hire the applicants for the 396 available seats of Social Worker, Block Programme Manager, Consultant Jobs as per the JRHMS Recruitment 2017 advertisement published on department web portal. Job seekers who have required eligibility may apply through Offline Mode after reading all the details of JRHMS Recruitment 2017 through this section.You are needed to send the application form in the appropriate format at the below address till or before 20th November 2017. Education Needed : Candidates who are willing to apply for JRHMS jobs must posses 10th / 12th / ITI / Diploma / Graduation Degree / Post Graduation Degree from any recognized board or institution. The candidates who wish to apply for the available vacancy should not be more than 35 Years As on 01-08-2017. Reserved category applicants will get the age relaxation as per JRHMS norms. Emoluments given to Employee: Contenders who will be appointed successfully for JRHMS Vacancy, they get the salary pay band of Rs. 25,000/- (Post 1,20,27,57), Rs. 30,000/- (Post 2,11,12,21), Rs. 40,000/- (Post 3), Rs. 44,000/- (Post 4), Rs. 16,000/- (Post 5), Rs. 31,500/- (Post 6), Rs. 26,250/- (Post 7,8,41), Rs. 10,000/- (Post 9), Rs. 7,350/- (Post 11), Rs. 39,930/- (Post 13,17), Rs. 30,250/- (Post 14,16), Rs. 21,000/- (Post 15,33,48,54), Rs. 24,200/- (Post 18), Rs. 18,000/- (Post 19), Rs. 35,018/- (Post 22), Rs. 35,574/- (Post 23), Rs. 35,018/- (Post 24), Rs. 31,500/- (Post 25), Rs. 10,500/- (Post 26), Rs. 25,200/- (Post 28), Rs. 18,218/- (Post 29,30), Rs. 21,840/- (Post 31), Rs. 50,000/- (Post 32), Rs. 33,000/- (Post 34), Rs. 36,750/- (Post 35), Rs. 31,000/- (Post 36), Rs. 27,720/- (Post 37), Rs. 15,750/- (Post 38), Rs. 41,202/- (Post 39,40), Rs. 19,800/- (Post 42,43), Rs. 45,000/- (Post 44), Rs. 14,013/- (Post 45), Rs. 13,650/- (Post 46), Rs. 18,900/- (Post 47), Rs. 33,880/- (Post 49), Rs. 50,000/- (Post 50-53,61), Rs. 19,800/- (Post 55), Rs. 37,500/- (Post 56), Rs. 40,000/- (Post 58), Rs. 23,000/- (Post 59), Rs. 35,015/- (Post 60) as per organization norms. Last Date to Submit Filled-In Application : 20-11-2017. Click Here For JRHMS Official Notification Link. Jharkhand Rural Health Mission Society is ready to hire the applicants for the 316 available seats of Medical officer Jobs as per the JRHMS Recruitment 2017 advertisement published on department web portal. Job seekers who have required eligibility may apply through Offline Mode after reading all the details of JRHMS Recruitment 2017 through this section.You are needed to send the application form in the appropriate format at the below address till or before 6th November to 10th November 2017. Education Needed : Candidates who are willing to apply for JRHMS jobs must posses Post Graduation Degree from any recognized board or institution. Emoluments given to Employee: Contenders who will be appointed successfully for JRHMS Vacancy, they get the salary pay band of Rs. 51,000/- as per organization norms. Selection of the job hunters will be done on the basis of their performance in the Certification Verification/Interview conducted by the selection committee. Closing Date to Submit the Application Form : 06-11-2017 to 10-11-2017. Jharkhand Rural Health Mission Society is ready to hire the applicants for the 39 available seats of Medical Officer, Lecturer, Reader Jobs as per the JRHMS Recruitment 2017 advertisement published on department web portal. Job seekers who have required eligibility may apply through Offline Mode after reading all the details of JRHMS Recruitment 2017 through this section.You are needed to send the application form in the appropriate format at the below address till or before 11th November 2017. Emoluments given to Employee: Contenders who will be appointed successfully for JRHMS Vacancy, they get the salary pay band of Rs. 33,000/- (Post 1), Rs. 31,000/- (Post 2), Rs. 28,000/- (Post 3), Rs. 25,000/- (Post 4-7) as per organization norms. Closing Date for Receiving Hard Copy of Application Form Is : 11-11-2017. Rajasthan Primary Education Council is ready to hire the applicants for the 42 available seats of Warden, Teacher Jobs as per the RPEC Recruitment 2017 advertisement published on department web portal. Job seekers who have required eligibility may apply after reading all the details of RPEC Recruitment 2017 through this section.Candidates who have decided to build their career in this organization they can attend Walkin Interview which are going to be held On 7th November 2017. Education Needed : Candidates who are willing to apply for RPEC jobs must posses Graduation Degree / Post Graduation Degree from any recognized board or institution. Click Here For RPEC Official Notification Link. District Court Bardhaman is ready to hire the applicants for the 60 available seats of Contractual Clerical Assistants Jobs as per the District Court Bardhaman Recruitment 2017 advertisement published on department web portal. Job seekers who have required eligibility may apply through Offline Mode after reading all the details of District Court Bardhaman Recruitment 2017 through this section.You are needed to send the application form in the appropriate format at the below address till or before 10th November 2017. Education Needed : Candidates who are willing to apply for District Court Bardhaman jobs must posses 10th from any recognized board or institution. Reserved category applicants will get the age relaxation as per District Court Bardhaman norms. Emoluments given to Employee: Contenders who will be appointed successfully for District Court Bardhaman Vacancy, they get the salary pay band of Rs. 10,000/- as per organization norms. Click Here For District Court Bardhaman Official Notification Link. Vector Control Research Centre is ready to hire the applicants for the 03 available seats of Project Technical Officer, Project Assistant Jobs as per the VCRC Recruitment 2017 advertisement published on department web portal. Job seekers who have required eligibility may apply after reading all the details of VCRC Recruitment 2017 through this section.Candidates who have decided to build their career in this organization they can attend Walkin Interview which are going to be held On 5th November 2017. Education Needed : Candidates who are willing to apply for VCRC jobs must posses 10th / Graduation Degree from any recognized board or institution. The candidates who wish to apply for the available vacancy should not be more than 30 Years (Post 1,2), 25 Years (Post 3). Reserved category applicants will get the age relaxation as per VCRC norms. Emoluments given to Employee: Contenders who will be appointed successfully for VCRC Vacancy, they get the salary pay band of Rs. 32,000/- (Post 1), Rs. 31,000/- (For Post 2), Rs. 16,000/- (Post 3) as per organization norms. Date of Interview : 05-11-2017. Botanical Survey of India is ready to hire the applicants for the 10 available seats of Para-Taxonomy Trainee Jobs as per the BSI Recruitment 2017 advertisement published on department web portal. Job seekers who have required eligibility may apply after reading all the details of BSI Recruitment 2017 through this section.Candidates who have decided to build their career in this organization they can attend Walkin Interview which are going to be held On 6th November 2017. Education Needed : Candidates who are willing to apply for BSI jobs must posses Graduation Degree from any recognized board or institution. The candidates who wish to apply for the available vacancy should be existing between 21 to 30 Years. Reserved category applicants will get the age relaxation as per BSI norms. Last Date to Attend Interview : 06-11-2017. Click Here For BSI Official Notification Link.